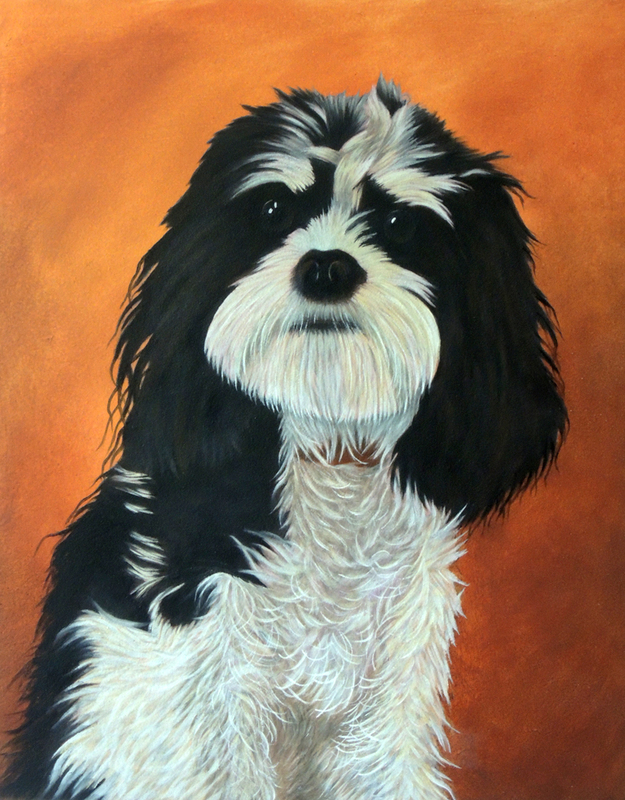 Capturing the likeness and personality of a pet is challenging and fun. I've done many pet portraits for animal lovers whose pets are valued family members, and for those who have lost beloved pets and want to keep them near through a painting. To get the best results when painting a pet, I need several good photographs to work from. They can be different poses, close ups, and distance. Good light is important to be able to see the features well. The eyes are very important for getting a good likeness. They show the personality and expression that gives the painting life. Snapshots are fine if the features are visible and clear. Prices are based on 1-2 pets in a painting. Additional pets may be added for an additional $75 per pet. Keep in mind additional pets may not be possible on smaller canvases. I require half of the final cost up front and that is non-refundable after the painting has been started. Most portraits are done in oil on gallery wrapped canvas so they do not require framing.